Worldstarhiphop and its ilk have made a name for themselves partly by posting candid, smartphone-shot videos of fights unfolding on street corners, in parking lots, and inside so, so many Denny’s restaurants. Usually they’re depressing, not just for the fights but for the rubbernecking crowds that cheer every flailing fist. Sometimes, however, the videos lack so much context that they function as mysteries unto themselves. Such is the case with the below video, which was initially shared by DNA Info. 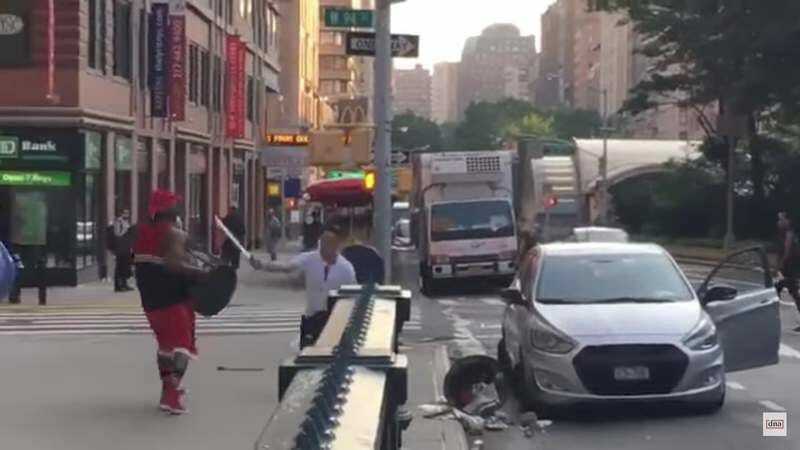 In it, two men square off on a New York City street, one wielding a machete and the other a garbage can. It only gets weirder from there. Here’s what we see: A man in red walks into frame holding a garbage can as if for protection. A man in white with blood on his shirt wields a machete but seems to lose interest in fighting after smashing it on the ground. He moves like he’s getting into his car, then goes for a cartoony sneak attack that he quickly abandons when the trashcan gets raised. When the man in red opens the car’s passenger door, the man in white takes a swipe at him with his machete, which dislodges from the handle and spirals toward the camera, thus proving that there is such a thing as a cheap machete. Without his blade, the man in white aims for a quick getaway but is soon yanked out of his car and drawn into a flail-off. The fight fizzles out as the pair throw half-empty soda bottles at each other. DNA Info reports that the fight began when the man in white, Luis Roman, became enraged by the man in red’s disinterested way of crossing the street and called him out on it. So many questions remain: Why is Roman already bleeding at the start of the video? Why does he smash his machete on the pavement? Why do both parties keep stopping and starting the fight? Where did that soda bottle come from? What’s the deal with the second, tipped-over trashcan? What’s the significance of all this trash? DNA Info also reports that nobody was seriously injured, thereby making it okay to laugh at this one.